Governor Jim Douglas announced that Vermont State Parks reported the busiest operating season in 15 years. As theregular season came to a close on Columbus Day, State Park attendance was up 15 percent over 2009 as 836,984visitors enjoyed Vermont beaches, mountains, campgrounds and trails. The numbers break down to 455,319 day use visits – a 23 percent increase over last year – and 381,665 camper visits. Forty-five percent of campers were Vermonters, while 55 percent were from out-of-state. Free falling, where will I end? Will it be land? Will it be sea? Will it be roots at the base of a tree? Through the dark tunnels I travelled, will I ever be found? A winner has been chosen in the contest to design a 21st century version of the old Vermont outhouse. 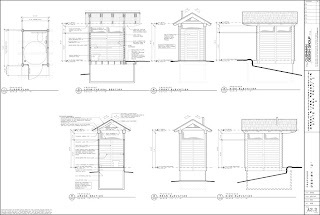 The Vermont Department of Forests, Parks & Recreation, in conjunction with the Vermont Wood Manufacturers Association, announced the winner of the “Going Green” trailside outhouse design competition at the annual meeting of the Vermont Wood Manufacturers in Woodstock, Vermont. The contest inspired several architects and design firms to submit outhouse designs compatible with CLIVUS composting toilets for use at remote trailheads and recreation areas, and state park and forest lands throughout the state. Participants were asked to create a simple, affordable wood design that could be built using native materials. The design had to be universally accessible, easy to assemble and maintain, use natural lighting and an eco-friendly finish. It also had to fit in with the aesthetics of state parks. Moosalamoo Cottage at Branbury State Park has had a makeover! The improved cottage feels quieter and cozier with the addition of paintings, carvings, antiques, and other unique decor. The added charm of these furnishings are provided by the Barn Antiques out of Middlebury, Vermont (available for purchase too!). Think of the cottage as a rotating art gallery - it could have different artwork every time you visit! All cottages in Vermont State Parks have multiple rooms which sleep four to six comfortably. Electricity, heat, indoor kitchen with refrigerator, stove, freezer, toaster oven, microwave, coffee maker, cookware, and sink, and an indoor bathroom with shower and toilet are all amenities in each cottage. Other cottages are located in Camp Plymouth, Crystal Lake, Half Moon, Ricker Pond, Shaftsbury State Parks. To ensure your week long vacation is secured, it is recommended that you book early!